PET FRIENDLY, WATERFRONT BEACH HOUSE WITH VIEWS! Come and let your worries wash away in our ever so relaxing beach house. Situated at Orions Beach and only a 1 min thong shuffle across the road and onto the breathtaking beaches of magnificent Jervis Bay. You will feel like you are on a tropical island. Lounge with a drink on the verandah while you watch the kids or pets play safely with the bay sparkling behind. Snorkel, dive or fish right across the road. 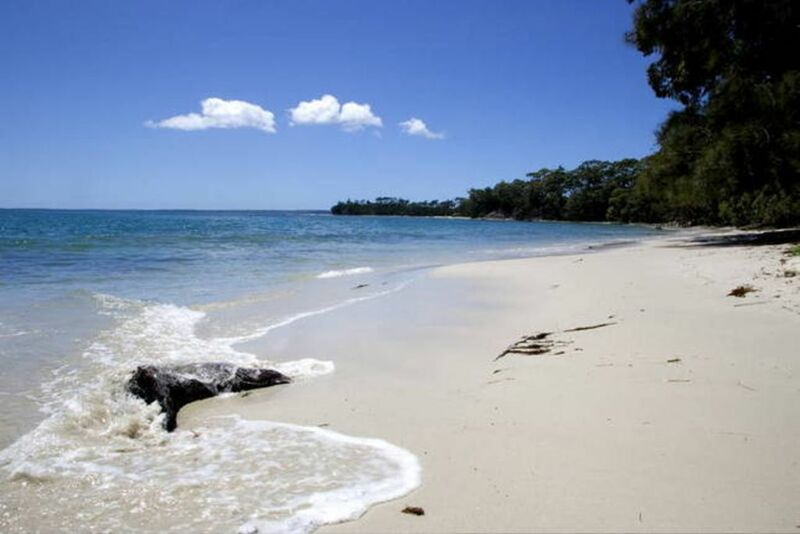 Jervis bay is renowned for its' spectacular diving locations. Stroll along the many coves and beaches exploring rockpools, beachcombing, or throwing a ball for the dog. Explore the many bush tracks that surround our lovely beaches. Our open plan living allows everyone to spread out but be within view and a quiet coo-ee away. All the comforts of home and just a 3min drive to the shops for all your needs. 5mins drive to Huskisson for more restaurants and shopping. Bring your pet along if you wish, our backyard is secure and pet friendly. The front is totally secure now also so you all can relax and watch the bay while you play. The kids will love this beach house and so will you, you really won't want to leave and you definitely will be back. Extra blankets and Electric Blankets & heaters for the colder nights. Large, fenced, grassed yard front & back for 360 deg playtime. Cruise the waters of Jervis Bay with our local tour company Dolphin Watch where you will visit all the secrets Jervis Bay has to offer. Cruise alongside the Dolphins as they frollick in the wash of the Tekin III. Catch the whales on their way up or down the coast. Tailored tours to suit your needs and budget. Ask for your vouchers when you book. Perfect location for convenience plus privacy. Comfortable practical facilities in-house for us plus occasional guests and pet. Very quiet street during working week yet busy with walkers, bikers, prammers - all happy and friendly. Whatever the weather - perfect view, access to beach, water temperature etc. Great holiday place - hope to do it again, for longer. Great location, very happy with the property. Great location, very clean, garden well maintained and well fenced for the dog. We look forward to returning. Lovely relaxed house. Perfect location. This property is beautifully kept and in a pristine location. Great for the whole family including four legged friends. There is a bike path right out front which allows for an easy flat ride to the local Coles and into Huskisson (right along the coastline). Good fitness park at the end of the street. Would definitely recommend. Great location right across the road from water. So pet friendly! Has a big yard front and back. The place was really clean and comfortable. Enjoyed sitting on the patio and relaxing. Would love to go back. Fantastic location and modern beach decor that made for a luxurious holiday destination. Plenty of room for a family with kids, including the fur baby.